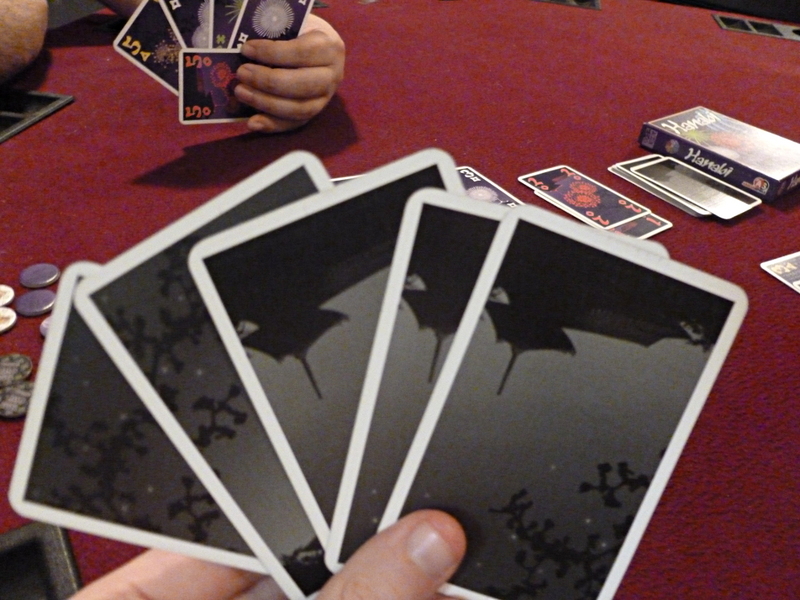 Hanabi is a card game with one major difference – you can see other players’ hands, but not your own. As a co-op game, you work together with the other players to deduce what cards you have in your hand, when and if you can play them, and how many points you can get before the deck runs out. Hanabi comes with a deck of special cards, information tokens, and lightning bolt tokens. Simply shuffle the cards (well!) and set the tokens scroll side up and lightning bolt side down respectively, and you’re good to go. You can take one action on each turn, which may be one of three things. You can give a clue to another player, discard a card. or play a card. Giving a clue comes with a few caveats, however; firstly, a clue token must be available (designated by the scroll). Whenever you give a clue, you have to turn the scroll face down to the grey back, so remember to keep track of your clues! Secondly, you can only give clues about one aspect of the cards in their hand – you can say what color a card is, what number it is, or that they have no cards of a certain color or number. Lastly, you must give the clue about ALL of the particular aspect that they may have in their hand. So, if they have two reds, you have to tell them about both, not just the one you wanted them to know about! For two players, you simply take turns going back and forth, giving clues, discarding (which turns a clue token face up again), or playing a card. For three or more players, you can give information about anyone’s hand, not just the person next to you. Remember to look out for the person who plays after you though – if they discard a valuable card and you had a clue open, you might get an earful! A developing game. Erik knows about the three cards on the right (his left), but will he play them correctly? The more cards you play correctly, the more points everyone gets at the end. Don’t play cards randomly, hoping for a match, though; if you get three lightning strikes, the game’s over and you don’t get any points! There are five suits (red, yellow, green, blue, and white) that all go up to five, so the maximum amount of points you can get is 25 – scoring counts the top card played on each stack. Try to get a perfect score – it’s harder than you might think! A finished game. We scored 22 points and used up one strike. Erik and I have developed a few strategies that help us communicate lots of information in one simple move or help us keep track of our hands. If you’re struggling to get a high score, try some of these out and see if they help! We both agreed that the game is really more about deduction than memory. So we added a house rule where you can ask what you know about a card, if anything. If I had a question about the last card in my hand, I would simply ask, “What do I know about this?” and he’ll tell me the color, number, or both if I know that. This helped me a ton, as I often got frustrated over the chore of keeping track of certain cards while also trying to give good clues about his hand – this way I can focus more on his hand, and making sure he doesn’t make any preventable mistakes. Of course, if neither of you can remember what clues you gave out, this might not work for you. Remember that there are 3 ones, 2 twos, 2 threes, 2 fours, and only 1 five of each color in the deck. This means most cards – fives more than any others! – are very precious. Keep an eye on your discard pile to make sure you protect cards whose pairs have already been discarded. And protect those fives at all costs! Arrange your hand in order of age. It’s likely that if you had something important in your hand, someone would have told you about it when it was new/er. This way, you can feel pretty safe about discarding your oldest card, as it likely isn’t important. This also helps other players, as they can be pretty safe in predicting which card you’ll discard when you need to. Also arrange your cards face-up if you don’t know anything about them, and flip them upside down when you learn something about them. Although you can’t see the front of your cards, there are pagodas on the back – if the pagoda is upside down, you’ll know you know something about it – and that you probably shouldn’t discard it! Generally, even if our known cards are our oldest, we discard from our unknown cards first since, as above, if there was something useful about those cards, someone would have said something about them! I know something about the three cards on the right – the ones with the upside down pagodas. If I need to, I can point to them and ask what I know or confirm what I think I know as a refresher. In general, tell players about cards they can PLAY, not cards they can discard. Discardable cards should be assumed so because you don’t know anything about them; they’re not worth wasting a precious clue token on. Sometimes you may have an important card in your hand that you need to keep hold of, but that you can’t play – but a different colored card of the same number may be playable. If you tell them about the card, they may get confused and try to play it, resulting in a strike against you and possibly losing your chance at completing a suit. To help with this, a hint system that I like (but Erik sometimes forgets) is to tell players about the NUMBER if you want them to PLAY it, and the COLOR if you want them to save it. So, if Erik drew a white four and we had the white stack up to three, I would tell him that his card was a four. If he drew the white four and the white stack was only at two, but we had discarded the other white four already (so he held the only one left in the game! ), I would tell him the card was white. Sometimes this can be problematic depending on the cards they have in their hand, but you can always give another clue later to clarify things. Erik has a new five he doesn’t know about, but if I tell him about it now while it’s new, he might think he can play it on the green stack. I’ll probably be safe if I wait a turn to tell him, since he’ll discard the green card and the white two first. I could also tell him he has a yellow, and later tell him it’s a five. So many choices! Remember to use all your resources! Scan the other players’ hands, the discard pile, and the played suits on every turn. You might know more about your hand than you think, and be able to deduce which of a card you hold even if you’ve only been told one of the color or the number. Lastly, remember that everyone gets one more turn after the last card is drawn from the deck. If you know something useful about your hand and you haven’t used any lightning tokens yet, it may be beneficial to try to get in a few last minute points! 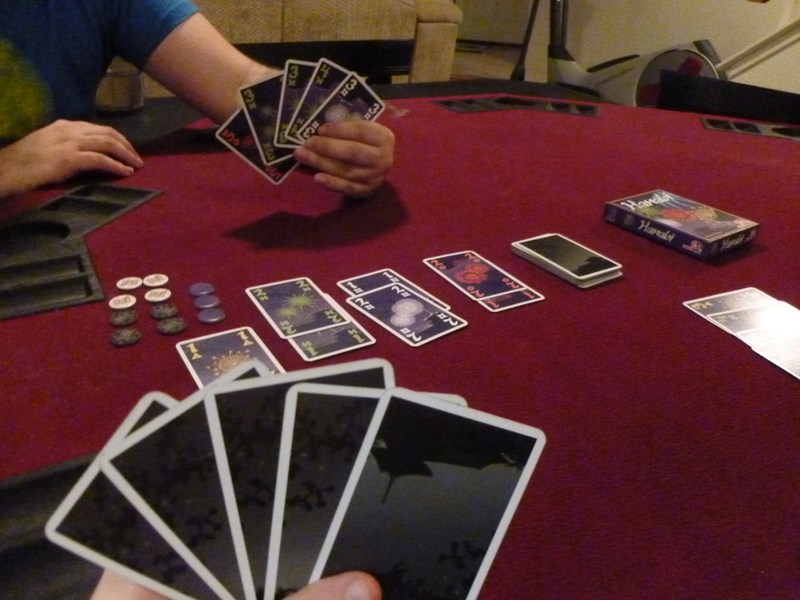 Hanabi is probably our most played game, since it’s quick to play and deceptively deep. Although there isn’t really any theme – often a dealbreaker for me – I still really enjoy playing, especially with our house rule to confirm cards in our hands. Hanabi is a great couples’ game in my opinion as well, since it works great with only two players. 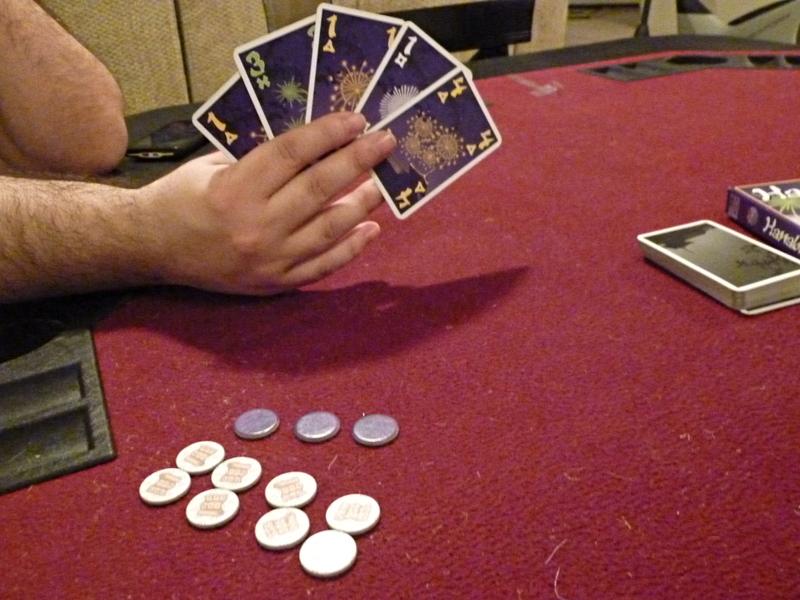 Luck: There is some luck in Hanabi, but most of it can usually be mitigated by smart play. Depending on how the cards some up, a valuable low number card may be shuffled low into the deck, and if you discarded its pair, you’ll probably be a very sad panda when it does come up and you can’t complete the suit. Due to the scoring system, I don’t feel as bad about lucky draws as in many games, as you’ll still get a pretty decent score if only one or even two suits are stuck on low numbers. 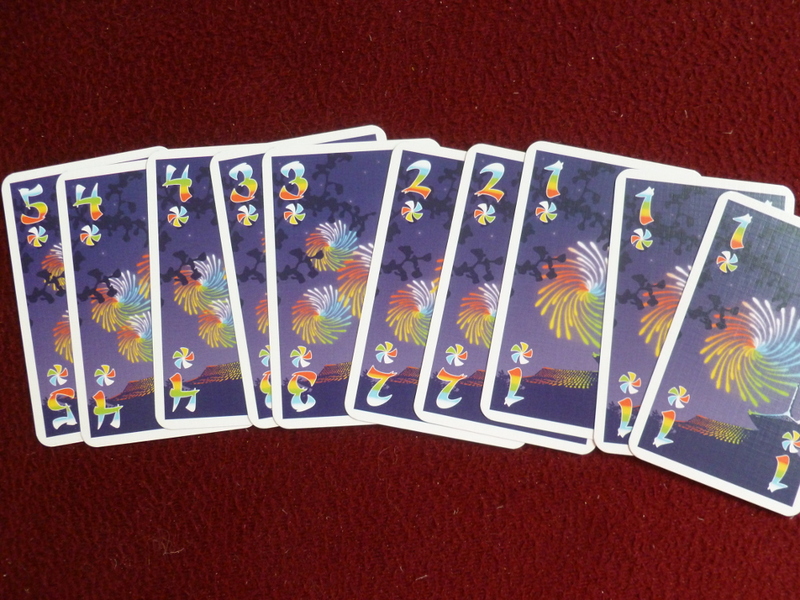 Plus, Hanabi plays so quick that you can just play another game afterwards to try for a better score. Strategy: Hanabi is deceptively deep. It’s all about communicating through your actions as much as your words and developing good clues that will make your partner(s) play in the way you expect them. Hanabi is great as a couples’ game in this aspect; since you’ll be playing so many games, you really form your own developed communication and strategy with your partner. You’ll probably be surprised at how much is left unspoken but understood if you try to play with more or new people! Theme: There isn’t really any theme, but honestly, the gameplay is engaging enough that it’s unnecessary. Sure, you’re ostensibly fireworks engineers working together to create a great fireworks show, but you honestly won’t feel much like that while you’re playing. instead, you’ll just be enjoying the interaction and scratching your brain to give good clues and try to determine what your partner meant by theirs. All the colors of Hanabi cards. You’re a fireworks engineer, so you’re working to build better fireworks to make a spectacular show. The theme doesn’t come across too much, but the cards are colorful and the number of fireworks matches the number on the card. Cards also have symbols unique to the color suit, so they’re colorblind friendly! 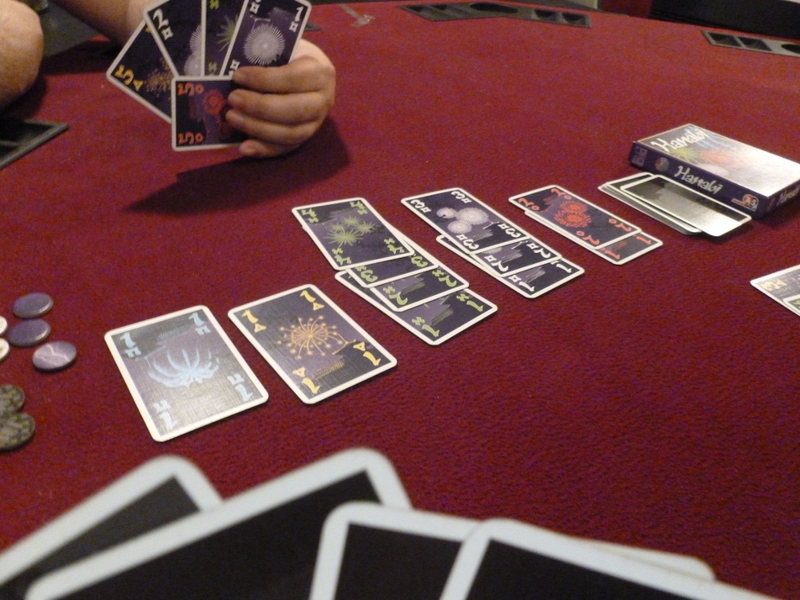 Interaction: As I’ve touched on, I think the interaction in Hanabi is great, especially with two players. You’ll essentially develop your own unspoken communication through actions and partial hints, and when you’ve played with the same person for a while, games go quickly and smoothly. Downtime can be a little bit of a problem, and more so in games with more than two people, in the case where your next move is fairly obvious and they’re taking a while to think about theirs. You may find yourself squirming in your seat as they deliberate as you really hope they don’t discard a dangerous card, or they think over the clue you just gave them. Unlike in some games, however, I’m usually engaged enough in Hanabi that, even when I’m waiting for my turn, I’m still planning moves and clues in my head, and I hardly ever find my mind wandering to other thoughts while I’m waiting. Replayability: Since the deck is shuffled and randomly dealt, you’ll have a new game each time you play. Some games will go great, while others you may find you discarded the wrong card at the wrong time, as its partner lays sinisterly at the bottom of the deck. Chasing after the perfect score every time is a loft goal, but if you get too confident, you can always break out the included rainbow cards to add some extra chaos and another suit to deal with. The rainbow cards are sadly not attached to poptart cats. They’ll still provide an extra challenge to you if you add them, though. Heaviness: Hanabi is definitely a filler game, but not a brainless one. If you’re looking for a filler that actually has some strategy and depth, Hanabi is a great go-to game. It’s simple enough to introduce to new people, but has enough depth that you may find yourself playing it over heavier games once you get familiar enough with it, perfecting your strategy and high score. Aesthetics: The card art is minimalistic and functional. The current deck might not win any art awards, but neither is it amateur. It works for the gameplay and is colorblind-friendly to boot. If you really want amazing art, you could always print your own deck, but, truly, it might take away from the functionality. Since the main draw of Hanabi isn’t its theme, I think it’s probably unnecessary, and the art works fine as it is. 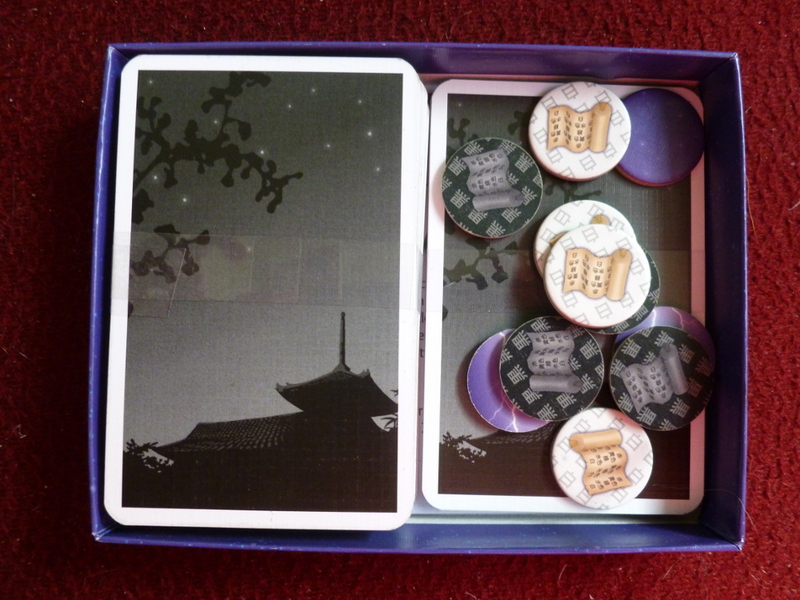 Component Quality: There isn’t much that comes in the little box, but the tokens are made from nice, thick cardboard and the cards are sturdy. 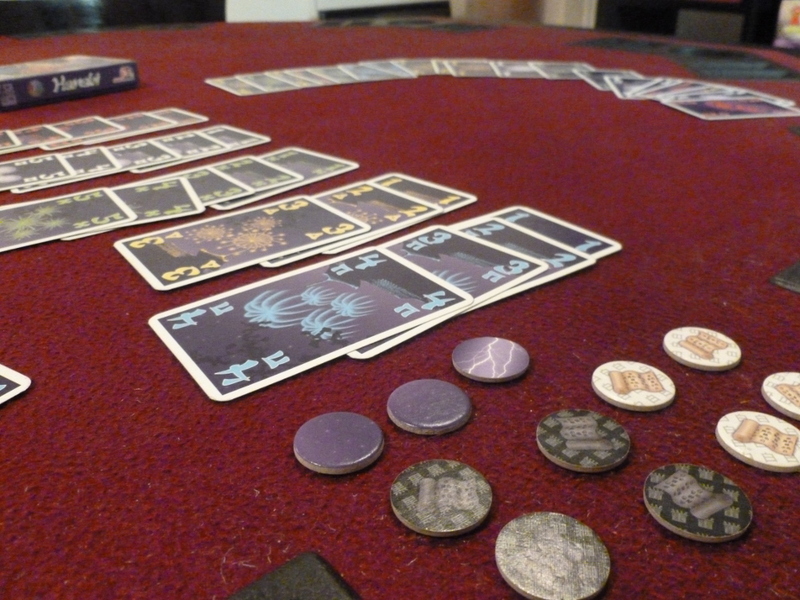 Value: As a card game, Hanabi is inexpensive to buy. You could even print up your own and make your own tokens, if you really wanted to save money. I’d recommend buying a copy if you can find it though, since it’s a game that’s worth every penny and I’m happy to give my support to the designer. For the hours of playtime we’ve gotten out of it already, Hanabi is an amazing value for the price. Our Hanabi box. Nice cards and sturdy little tokens in a compact container. Great for taking anywhere! For less than $15, it’s an amazing value. 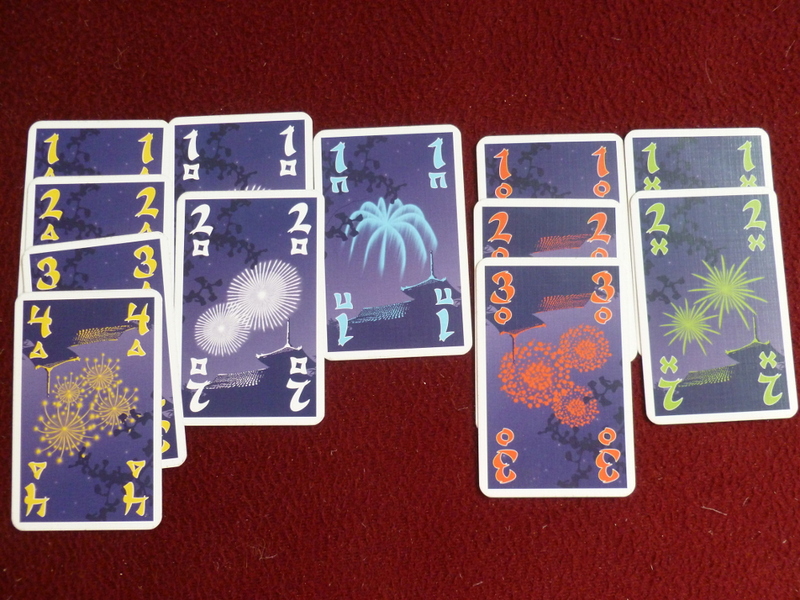 Overall: Hanabi is a great little card game suitable for play as a quick filler or for several plays alike. Great for couples and a fun group game as well, I can’t recommend getting it enough – if you can find it, don’t hesitate at all in adding it to your collection.